My Disappointment in Cloud Being in Super Smash Bros.
My nightmares have become a reality, as Cloud from Final Fantasy VII has been announced as an upcoming DLC character for Super Smash Bros. for Wii U and 3DS. The November 2015 Nintendo Direct was mostly solid, with the official confirmation of Twilight Princess HD for Wii U, a release date for Star Fox Zero and a number of other titles, and some interesting news on updates for already-released games like Splatoon. But then it ended in the worst way possible (for me, anyway). A new Smash Bros. character reveal is usually an awesome thing, so I was happy to see the Nintendo Direct ending with the words “Super Smash Bros. for Wii U and 3DS” showing up. But then, the horror of it all, it was followed up with the words “X Final Fantasy VII.” My reaction was something like this. After naming Cloud as one of the five third-party characters who should never be in Super Smash Bros., it’s suffice to say I didn’t take kindly to the character’s addition to the series. There go my hopes of Smash Bros. ever getting a good Square-Enix character. 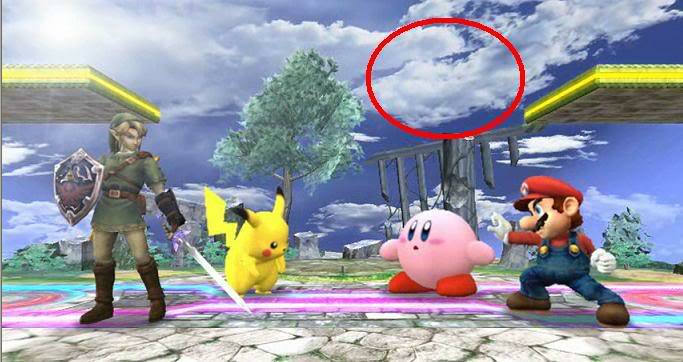 Cloud’s inclusion in the game just doesn’t make any sense. Weren’t any possible third-party characters in Smash supposed to be characters who have significant ties to Nintendo? Sonic, Pac-Man, Ryu and especially Mega Man all make sense. Even Solid Snake made sense. But Cloud? His biggest appearance in Nintendo’s history were a handful of cameos in those handheld Kingdom Hearts games that people like to pretend don’t exist. There are just so many more deserving characters out there. Simon Belmont comes to mind. Or how about Bayonetta? Banjo-Kazooie? Hell, there are actual Nintendo characters who have yet to make the Smash Bros. roster (Dixie Kong). Yet Cloud makes it in? Besides, don’t we have enough anime sword characters in Smash already? We already have a small army of Fire Emblem and Kid Icarus characters. Cloud is little more than white noise at this point. I came here expecting a ramble, and a ramble I got, Im not dissappoint. Anyhow, Cloud reveal was certainly…surprising. He was never a character I support ed and Id have picked a bunch of other Square reps over him anyday myself, but he looks a lot of fun to play at least, and to be fair, hes probably the most reconizable face of the FF series, so at the very least he’s a pretty big icon and not a complete nobody (like if an indie was added). FF7 is definitely overhyped, but I cant say it has aged badly besides the graphics and some what shaky translation it got, the combat still holds up pretty well, even if its not my favorite in the series. I’ll agree most of its characters arent very interesting though, not terrible and as edgy as some of its later media would make them (particularly Advent Children and KH), but still pretty flat over all. I think the biggest positive thing I got out of this is that Snakes chances to return get higher anf higher (at this date, it feels theres no limits tp who can get in anymore), so hopefully december will give me a pleasant surprise on that. I hope Snake doesn’t get in. Sakurai put Snake in brawl, and basically got nothing in return from Kojima. The reason why Snake was in Brawl was because Hideo Kojima tricked Sakurai into thinking that he would make something for the Wii if he did. It’s also because Kojima’s son wanted Snake in Brawl. Guess what he and Nintendo got in return? Nothing. Snake does not deserve to be in Smash again. I’ll take Cloud over Snake anyday, because I’m so sick of Kojima these days, and how he’s bought in to the “Nintendo is for kids” mentality, also saying that he couldn’t figure out how to use the gamepad for MGSV, yet he had no problem coming up with an idea to integrate the use of smart glass in the game. As if any third parties really gave anything in return to Nintendo for featuring their characters. Street Fighter only had a 3DS port of a dated version of SFIV, Pac-Man its irrelevant outings in an attempt to move to the third dimension (not even the Championiship games, which are liked), and Sonic a bunch of fairly mediocre 3D platformers (which I guess Colors is an exception to the rule, but that’s one game out of how many since Sonics debut in Brawl? ), which leaves Megaman as the only one that’s been releasing its latest games on Nintendo systems, all 2 of them before Capcom put the series to rest. As it is, Metal Gear is on the same league as SF in deserving to be featured (because of Snake Eater 3D, and it’s kind of as out of place art wise as Ryu), and above Cloud as, at least Nintendo got some mainline Metal Gear releases, and not just a bunch of spinoffs/minor releases that happen to have Cloud appear in somewhat, if we take that criteria of deservation anyways, which I think is unexistant at this point given the recent events. I’ve never once read Kojima or Konami promised anything to Nintendo for Snakes inclusion either, so….source? I can’t say I read anything about Phantoms Pain development on WiiU, so I have no idea on the reality of that, I’ll give you that Kojima is kind of a narcissist though. I think it’s because Nintendo and Square Enix have made some sort of deal where one of SE’s games comes to Wii U or 3DS (Maybe the FFVII remake). I mean, when Sakurai picks characters for Smash Bros., he usually has a reason behind it, I don’t think that Sakurai is stupid enough to put Cloud in just to appease the fanboys, like I said, there has to be some sort of reasoning behind it. It could have to do with FFVII in some way or some other deal, but I’m not keeping my hopes up, because SE and Nintendo don’t really get along. Also, to go off topic, I think the FFVII remake should have been on the 3DS. It would have been far cheaper for SE to make and it would have made them A LOT of money. Maybe they are going to bring FFVII to Nintendo platforms for the first time, who knows. But I wouldn’t put it all on Sakurai just yet. I think we need more information first.